The following day she posted another verse and then tagged me in it. Might I just sidebar here and say this is one of the reasons I love her so!? It's what friends do. I'm blessed to have her, as well as my lifelong bestie that I don't get to see as often but that also means the world to me. Friends check in on friends. They encourage and uplift. They're there in action, not just in words. This has been true for both of them. Back to my point. Sometimes life is just plain hard. It slaps you in the face, has you rolling around in the mud and grime of the pity party you've thrown for yourself, and it can lead to you seeing life through blinders. What are blinders you may ask? 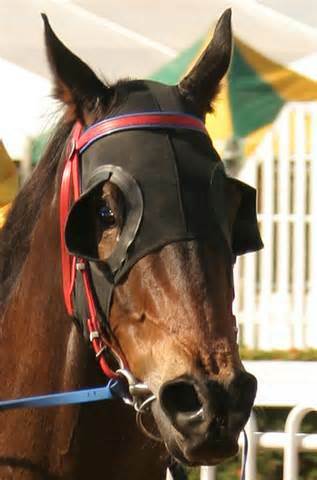 Well, there are varying types, but when I think of blinders, this is what comes to mind. A race horse. One that's wearing blinders. Blinders that prevent him from seeing anywhere but directly in front of him. He's rendered incapable of seeing side to side, behind..... only what's right in front of him. And that's where I've been. Satan loves blinders. If he can get us to only see the problems in life, then he has us in a place where we're vulnerable (even more so) to believe his lies and fall prey to his manipulations. He can begin twisting our thinking and convince us that life is about things that don't really matter. Sure, life has thrown us some curve balls. There's a lot going on within our families. A lot of added stress, particularly at a point in my life when I don't need extra stress. But alas, sometimes life doesn't afford us a break. Such is that time. There are adults acting like children, there are financial burdens weighing on some threatening to consume them, others holding grudges and taking their problems out on me, as if because they have a problem with someone that I should as well. There are situations that appear to be lose-lose, regardless of which path we take. My phone is constantly blowing up with calls and texts. It can barely keep its charge. I tire of hearing it ring and ding and beep and glow. I tire of holding my finger up to my kids telling them "just one more minute" which turns into 20. There are those who've offended me and hurt my feelings (most likely unintentionally), causing me to feel left out and unvalued. There's my need to live a more simple life, in part because of the simplicity and freedom it brings, in part because I want my children following after the Father and not stuff, and in part because I feel God has called us to be more simplistic in our living. And there are times I feel I've offended people, yet it's not about them. And there's proceeding from here and how to best handle the situations that have helped feed into the problem of clutter and the mentality of "I want, I want, I want." There's being pregnant with Emilee and all that goes with that - you know, hormones and being extra emotional, which only feed in to the other surrounding problems and help my blinders to grow larger and larger. And then there are those that make things worse with their comments. Allow me to sidebar here again for a moment. If you know a pregnant woman, see one, have any interaction with one: BE CONSIDERATE with your words. Asking if she's sure they have her due date correct is not considerate. Asking her if she's having twins is not helpful. Saying "that shirt sure is getting snug" isn't beneficial to her in any way. We do not need to hear your horror stories. We do not need to hear your unwarranted opinion on what size our family should be or how children ruin life as we know it. All your doing is being hurtful. If you're referencing her size, you're not telling her anything she doesn't already know. In fact, you're only making it worse, causing more self consciousness. Be considerate. Use the brain God gave you. And if you're her husband, it's your job to make her feel beautiful and remind her of the gift God has given you two, to cherish your baby with her, to take every opportunity to feel the baby move and kick. You're the one God gave her to help counteract the idiots in the world. Be that person. Ahem. I'm done now. Where was I? Blinders leave us feeling under valued, hopeless, isolated, and stressed out. They blind us from the good around us, the blessings that are still in abundance. I hate blinders. When you're wearing them it seems perfectly legit. You have every reason to. And sure, everything I've said is true. It's all going on in our lives right now. But so is soooo much more! So much good. So much faithfulness. I've neglected to see it because of blinders. I've been overwhelmed, exhausted, feeling like I'm barely present for my husband and kids. I'm tired. I'm worn out. And when I sent a message to my singing buddy this past week about songs we wanted to do for services Sunday, my heart wasn't in it. I didn't want to sing. I didn't want to be in front of people. I didn't want to think about songs, sing them, or even hear them. I wanted to stay in bed and throw myself a pity party. But alas, as I've already said, sometimes life just doesn't afford us a break. And so we chose some songs and carried on with our week. Days passed and I must confess I never even listened to the songs, much less rehearsed them, you know, until Sunday morning on our way to church. God must have a sense of humor. And I love how He often works, because yesterday was no exception. There I was riding on the way to church, listening to the tracks we'd chosen, barely even humming along when Mark asked me "Why aren't you singing?" My reply was simple: "Because I don't want to." And as the second song began to play, God began moving. And as I sit here typing this, recalling that moment, tears are filling my eyes because of His faithfulness. Because of His divine providence and how He uses ordinary things to bring us back to Him. The song? How Can I Keep from Singing. Go ahead. Laugh. I did too. Shoot, I am now. It's funny. I can sing despite whatever life throws my way! I can sing in the troubled times, when I lose my step, I can sing knowing He's there, that He'll pick me up and carry me through. He's been working through others to show me His faithfulness. My bestie told me someone (a mutual friend) sent her a text asking about me and then committed to praying for me despite not knowing the circumstances. Another friend that I don't even know all that well sent me a text asking how I was doing. He's faithful. He has not forgotten, not even for a second. My bestie constantly reminds me of verses of His provision and faithfulness, prays for me daily (if not multiple times a day), and has patiently listened to me whine for some time now, despite having her own struggles to deal with. It's going to sleep at night with Mark's hand resting on my belly, feeling Emilee move and kick. It's waking up from a nap with his hand resting there awaiting her next move. It's poking me to see if she'll kick back. It's his hugs and kisses, assuring me he loves me, that I'm not fat that I'm just carrying our baby, that I've only gained 8 lbs so far. It's him, everything about him and his love for me that reminds me of my Father's love for me. He's using the people around me to remove my blinders and open my eyes to His goodness. It's a stranger at a banquet saying "Well look at you. Aren't you as cute as a button?!" It's Anna and Eli hugging my belly, saying "Hi Emilee. This is your big sister" or "Hi Emilee. This is Eli. You can sleep in my room." It's everything that I've been blinded to for the past few weeks because I've chosen to see life's problems instead of its blessings. And brick by brick, I'm tearing the wall down, removing the blinders. And He's oh so good!